A Newport Beach home and private gallery showcases a range of African art. Among her favorite pieces are the painted carved colonial figures from Africa’s Ivory Coast, which stand 5 ½ to 7 feet and the 6-foot tall women with expressive faces carved from palm fronds from the Natal region. Kutash carefully guards the individual names of many artists because of stiff competition in the import business. The prices for pieces in her collection are comparable to those available at high-end design centers. A hand-carved wooden “colonial figure” from Africa’s Ivory Coast is a mix of African and European cultures. At left: A 6-foot-tall sculpture of a flautist is shaped from a palm frond. 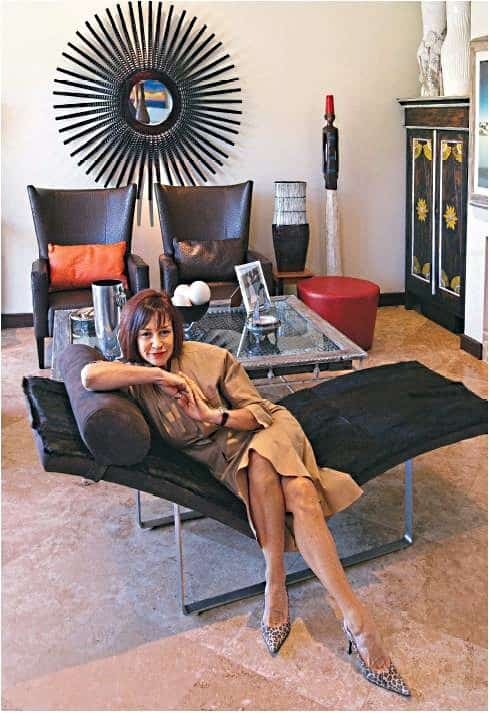 South African native Noleen Kutash uses her home to show African art and contemporary furniture. Below: Ceramic vases by artist B. Jackson rest on a yellow jarrah wood dining table below an ostrich-egg chandelier. The jarrah wood was salvaged from old railroad ties.